I know, I know: nothing for years. The blog is dead, long live Twitter. But you know? Some things deserve more space. No, literally, look at the label. 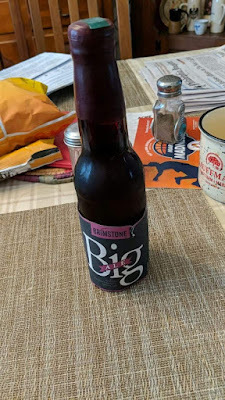 I was digging in my Beer Fridge today, looking for two bottles of proper beer to make carbonades Flamandes (more on that later) on this disappointing snow day, when I found two bottles of Brimstone Big, a Maryland-brewed barleywine from the 1990s that we cherished back in the day. The brewed date on the label: October 1998. Actually, there were three bottles, and one, not pictured, was actually older, and had been brewed at Brimstone. See, Brimstone was a great little Baltimore brewery, but things got tough for microbrewers in the mid-1990s (they did, despite what revisionists may tell you), and Brimstone was failing. They got bought by Frederick Brewing, who made this in their large brewery outside Frederick, Maryland. Frederick also bought long-time Maryland microbrewer (I'm deliberately using period terminology here) Wild Goose, while continuing with their Blue Ridge brands. I visited Wild Goose on the Eastern Shore with my new wife (she's still my wife) back in 1991, when we were expecting our first child. We took a vacation to the Outer Banks to celebrate being just us one more time. It was a great week, though except for that stop at Wild Goose, and a quick stop at Weeping Radish, so-so for beer. Anyway, all of this would eventually fail. Frederick was operating on a shoestring, owing back taxes, courting buy-out partners (at least one of which failed themselves, rather spectacularly). They were finally bought by Flying Dog out of Colorado in 2006, who saw the value in this large, sadly underutilized (and again: not a fan of "utilized," but this is an absolutely proper use of the word) brewery. Flying Dog invested in the brewery, and eventually moved all of their brewing operations there in 2010. Last I heard, they were expanding. All of that...is just to put this in context. Brimstone, and this bottle of Big in particular, is an American craft brewing fossil, a relic. As is, I suppose, my Beer Fridge (which I got for free from someone who was upgrading back in 1993; it was old then, but has never stopped running), and me, to hear some people talk. But I saw this bottle, and then I opened it, and smelled it, and...for some reason I just had to blog. I dunno, old habits, I guess. So let's talk about this fossil. As you can see, it poured tremendously bright, largely thanks to sitting upright for at least sixteen years, I suppose. The bottom was covered with a well-compacted layer of, as we always called it, mung. It had an oxygen-scavenging cap, but the beer is beautifully oxidized, in that sherry/dried fruit way that barleywines get, not the wet cardboard smell that lesser beers develop. Sherry, dried cherries, a touch of old-school hair tonic, and even some clean malt. Amazing, really, and a testament to Marc Tewey's brewing (and packaging) skills...and maybe that cap technology. There's persistent carbonation; 20 minutes after the pour, there are still small, steady streams of bubbles rising. I kinda wish I'd saved this till I was with Will Meyers at Cambridge Brewing; this is his metier indeed. Time to taste. The fruit is big, the malt is subdued. I remember Big as a fruitbowl of a barleywine; this fruit has dried, and soured just a touch. Definitely oxidized, but again, in a good way. There's no cardboard here, though there is a slight puckery astringence. No bitterness at all, but Big never was that bitter. The carbonation is firm, if not fizzy; it's one of the most pleasing parts of this. 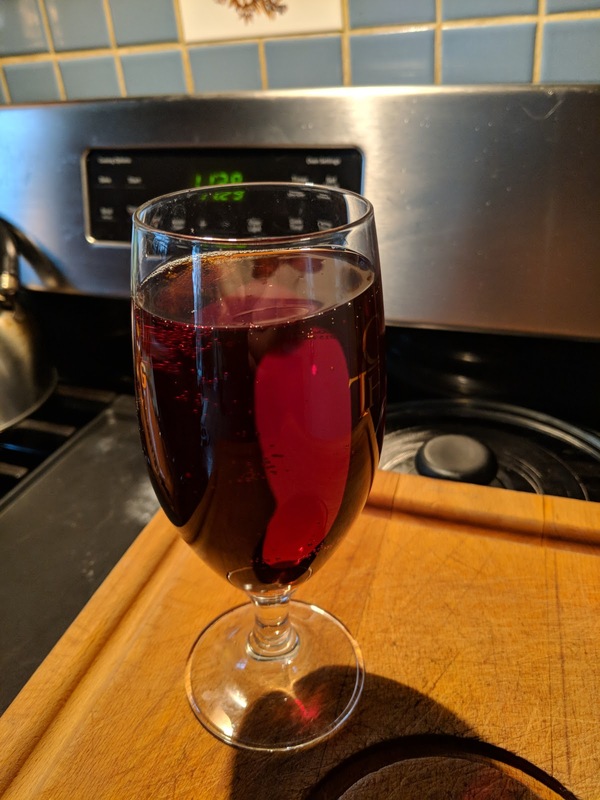 The body is about medium; I think there's been some secondary fermentation going on, because Big used to be, well, big in body as well as flavor. The finish is velvety, but the bubbles keep it from being clingy. If I had to ding this one, it would actually be on being a bit too sweet. I like the touch of tart, but there's too much residual sweetness, it's not balancing. Still, I'm looking for trouble, really. This is as solid a 20 year old beer as I've ever had, and I've had the chance to have quite a few. Which brings me back to the carbonades...you know you're living life right as a beer guy when you go to the fridge to get a bottle of beer for adding to beef stew -- even an exceptionally delicious Belgian version -- and you see a bottle of Westvleteren XII, and you think, 'Yeah, that'd be good to pour into a pot of meat,' and grab it without flinching. I'm putting a bottle of pre-AB Goose Island Peres Jacques in there, too. We're eating well tonight. Huh. Might have to come back here more often. I see the lights still work. Just need to dust a few things off. See you around. No promises, but...see you around. One last set of Irish, and this one's from my trip back in March. 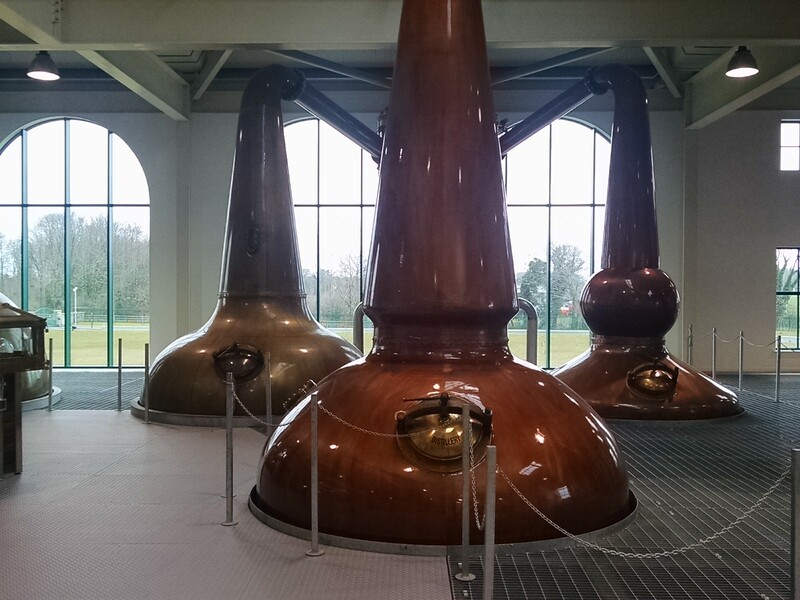 A three-day press jaunt to the new Tullamore Distillery. 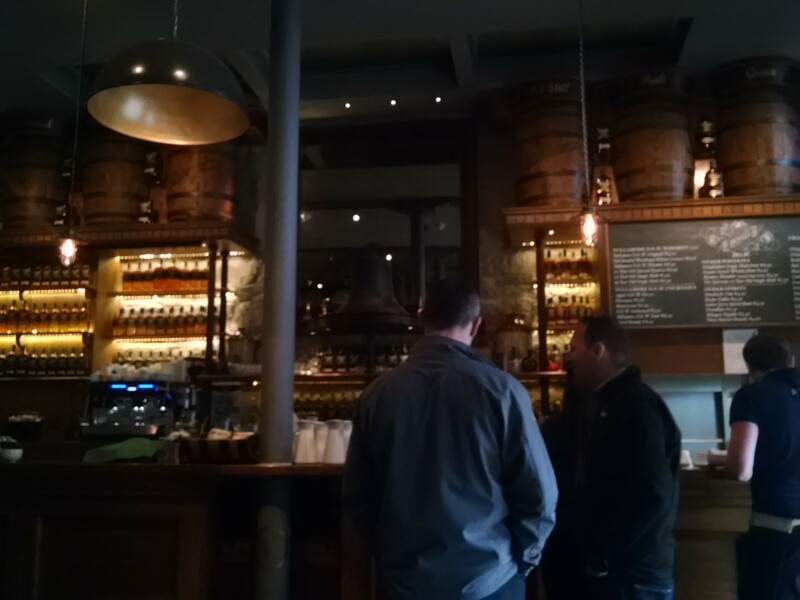 We were there for the launch of the new 14 and 18 year old Tullamore Single Malts. I got to see some old friends -- Ian Buxton, Mark Gillespie, and Gavin Smith among them -- and made some new ones. 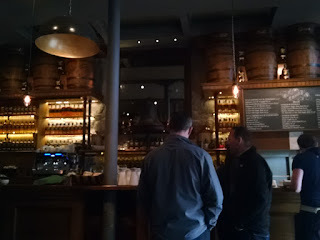 We also drank a large amount of whiskeys, and got in a lock-in at the Brewery Tap in Tullamore. It was a good trip. 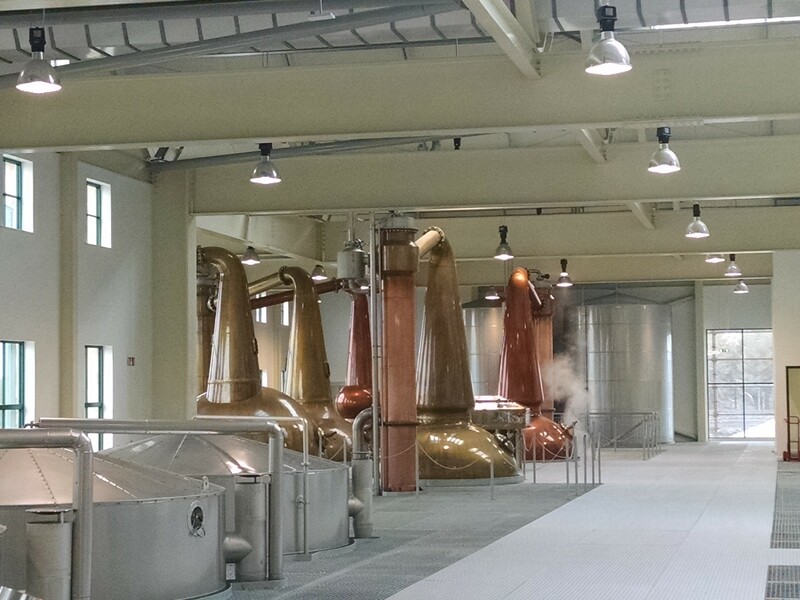 The new Tullamore distillery is beautiful. 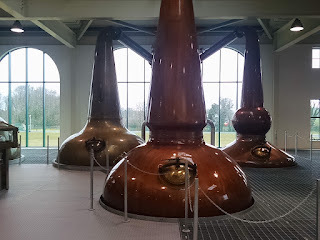 The outside has been done in an old style of stone and tall windows (and in 50 years will probably look old, but it's rather fresh, now), but the inside is very modern indeed: spartan, almost, until you see the rubbed copper of the stills. Now...none of the whiskeys I'm reviewing here were made at the new distillery. Can't be: the distillery only opened last year. 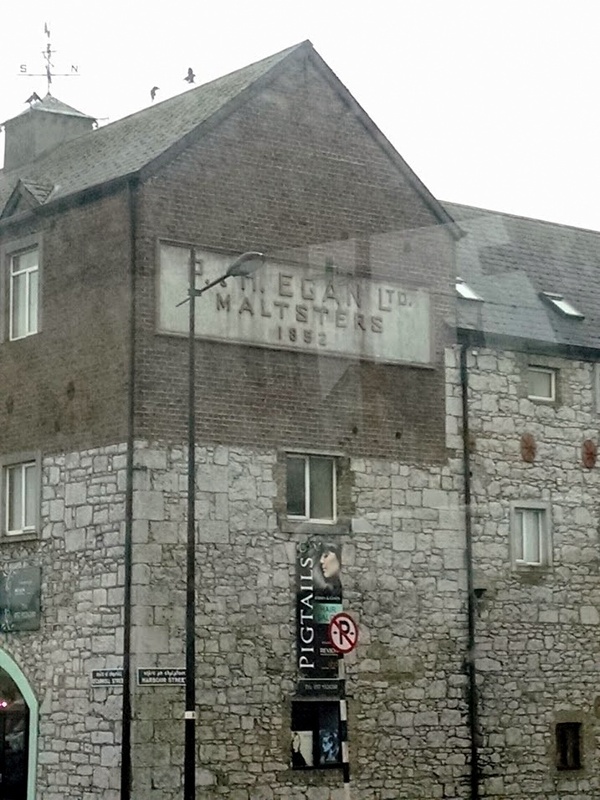 Tullamore's been without a distillery since the 1950s. Irish whiskey's had a really rough patch, but it's back up, and this beautiful (and large) new place is just one more piece of evidence of just how well it's doing. We were told that the Wm. Grant company made the decision to build the place here (just outside of Tullamore, where the old distillery was), even though the ground was not of the best for construction, because they realized that the Tullamore Distillery had to be in Tullamore. Good thinking, boys. Where were they made? The blend, at Bushmills and Midleton. The single malts? It was confirmed, verbally, that they were both made at Bushmills. Moving forward, they'll be made here, but not for quite a while yet. Here's the stuff...waiting. Didn't have the standard bottling handy (must have drank it all), so we'll go with this. Like that one, this is a blend of malt, grain, and single pot still whiskeys (I remember tasting this one next to the 10 year old and thinking there wasn't enough difference to make a distinction. But it's been a while, so let's see. Definitely Irish: the single pot still fruity grassy notes are coming through, with a warm note of stewed pear that just rings golden in the nose ("rings" and "golden", of course, being a sound and a color...in the organ of scent; just work with me, okay?). Oh, that's nice. The cereal notes are broad in the mouth, sweet and clean, and the fruit blends in, like a creamy hot breakfast. Fairly simple stuff -- I'd like some more wood character -- and just a touch of dry-oat pull at the end, but a nice glass. Does it rise above? Well, no. Mostly it's just nice. Both the 14 and the 18 are four-wood whiskeys, aged in bourbon casks, then finished in a combination of bourbon, Madeira, port, and Oloroso sherry casks, with the whiskeys then blended in varying proportions to create a harmonious product. We got details, and I'll add that in a future post, but for now...I'm realizing that this is the first time I'm tasting this "off the premises," in the distillery bar and conference area, a nicely set-up place equipped with distiller, blender, and brand ambassador. It's also the first time I'm tasting it healthy: I was sick as a dog on the trip, and stayed sick for a couple weeks afterward. So this is, in a way, my first time tasting these. Nicely dark gold in color, with a slight shine of green. The nose is of flowers and mixed pastilles, and high notes of rhubarb, with a darker layer of wood and anise underneath. Now, there is the complexity I was not finding in the 12 year old, and it's not simply piled on, either. Warm cereal breadth rolls with dry fruit, flashes of light caramel, and an undulating floor of solid, firmly-edged wood. The anise is a suggestion; pegs in that wooden floor. The finish is soft, with the oak receding and the dry fruit lingering. Nowhere near as sweet as the blend; not a cereal-heavy malt, either. Bushmills knows it needs wood variety to give its light malt spirit something to work with as it ages; clearly Tullamore has learned the same lesson. and then went and had dinner. Normal night. Different ratios than the 14 year old, and finished longer in the four woods; a minimum of six months. I remember thinking that the 14 year old tasted fresher, and that I liked it more. Then the rest of the group went off to the hotel, which Suzanne Redmond and I took as an opportunity to sit down at the distillery bar with Jennifer Proctor as our willing host...and Suzi proceeded to work on changing my mind by the simple expedient of pouring more 18 year old in my glass. She's a clever one. It worked, but as noted above...now I'm here, and not sick, so let's see how it stands up! The nose is more elegant, more restrained; the 14 is almost puppy-eager in comparison. Everything blends together in the 18, even and balanced. The cereal notes are here, but so are clear port-rich tones, and that dry fruitiness, and wood like a cradle. 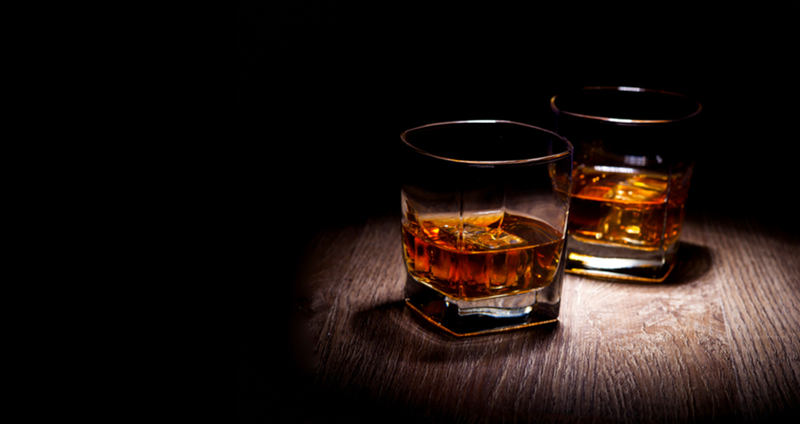 The whiskey spreads rapidly in the mouth, floating and pooling. The sweet fire is fruity and rich, but framed by a solid oak press; it has depth, it most certainly has weight, but it also has a freshness, almost like cool water. Much goes on here, and doesn't stop, evolving right to the final wisp on the breath. What was likely a fairly simple malt has been nourished and nurtured to become a multi-faceted gem of a whiskey. Nothing is out of balance. Finishing this sample. I regret to say that four months after resigning my position as managing editor, I will no longer be writing a column or whiskey reviews for Whisky Advocate. After more than 20 years of being part of the voice of the magazine, I was told on Monday that because the magazine was "going in a different direction," my services in those capacities were no longer needed. I was afforded an incredible opportunity, and I'm grateful for that, however it ended. It has also been a complete pleasure to work with this loosely-knit team of the best whisky writers in the world. Every three months, fascinating writing would arrive in my inbox, affording me a fantastic whisky education. It has been an equal pleasure to work with representatives from all parts of the industry, to watch that grow from a solid core of long-term veterans in the mid-1990s to a small army of exciting new personalities as the industry entered another boom phase, and then to welcome the small producers of the craft distilling category. I very much look forward to continuing that association. I've certainly also enjoyed the readers of the magazine: their excitement, their loyalty, their engagement, and their eager interest in the brown spirit that's entranced us all. It's been fantastic to meet you at the events over the years, and I hope to see all of you in the future. Of course, I'm not leaving whiskey! 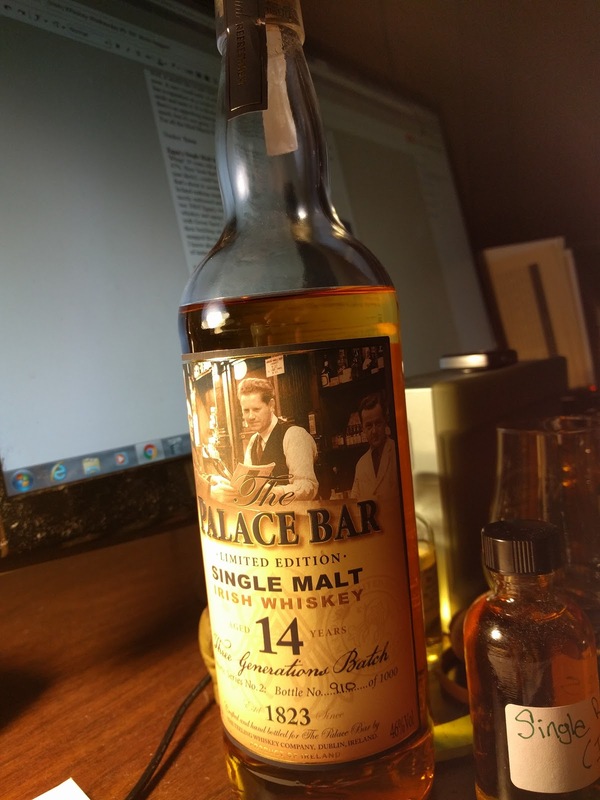 There's a new book project to work on, I've returned to writing this blog (really, I have, and I know I owe you some whiskey reviews), and several magazines have welcomed me back as a freelancer (with more projects in the works). I'm also back to writing about beer, which I missed terribly, and that will now expand as well. I may even expand my writing into new areas; I have a couple projects percolating. One door closes, and many more open. What do the different directions of the future hold for me? Nothing's sure, but I hope it holds more opportunities to see each of you, and more chances to work with you, in some capacity or another. I'm certain it will hold more chances to share a drink and some laughs. Well, Session Beer Day, yesterday, was great. 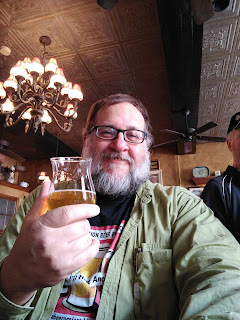 I spent the afternoon at the Bulls Head Pub in Lititz, Penn. (and I'll be back Sunday afternoon to do a whiskey dinner...still a few tickets available!) cruising through 16 taps of session beers at 4.5% and LESS. Great time, some great conversations, and some very nice beers. I'll run through them in capsule style (like I did with the big beers from Split Thy Skull). But I'm kind of dealing with the let-down at this point, the post-Session Beer Day blues. I need some good music to get me going again. Liked this version better anyway; electrifying. A "Zwickel" is a little valve on the side of a fermenting vessel where the brewer can, with proper care and sanitation, pull off a sample of the beer in the tank. An invitation to "tickle the zwickel" is always the high-point of a brewery tour: fresh, unfiltered, unaltered beer, as usually only the brewers get to taste. It's the real stuff. Some lager brewers will package -- lightly -- a 'zwickel' beer, also called a 'kellerbier,' or 'cellar beer.' The beer gets minimal filtering, usually just a long settling in the tank, and is packaged for quick sale. Get it, drink it, love it. Let's see how Dan Carey did on this one; expectations are high. Beautifully bright, dark straw gold, bright white head. Wetly-fresh bread, grassy-floral noble hops aroma: it smells fresh, which is the key to a good zwickelbier. Tastes clean, malty, balanced with a bitter finish. A bit sweet up front, but the hops quickly kick in. Have you heard people say, "This tastes like beer"? Or complain about beers that don't 'taste like beer'? This tastes like beer. I like pepper. Not peppers, though I like some of them, too, but peppercorns, ground (or whole). I would have been one of those guys sailing leaky wooden caravels around the Cape of Good Hope, searching for the spices of the Indies, because I would want more pepper than anyone else. I'm told that the Pennsylvania Dutch love black pepper, and I do, and once I saw a Berks County friend shake pepper on his ketchup till it was black, that was me. Love that. So when I see a peppercorn beer, I dive in, and I've rarely been disappointed. The Daily Grind smells a bit perfumey -- but peppery -- and I can't seem to raise a head on it, but I'm still optimistic. Sweet and yeasty, and I'm looking for the pepper. It's subtle, but it's there, and as I take another sip, I can feel it build a bit. But I'd really like more. More sips don't do more; we've hit peak pepper. I'm bummed, because the Starr Hill King IPA Habanero I had the other night was NOT subtle, it did the trick. Sigh. I'll have to keep looking. 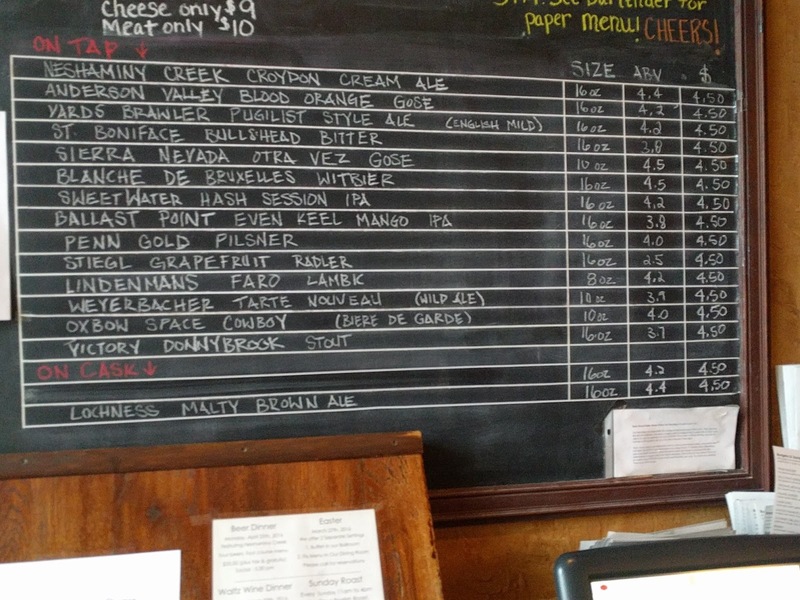 I went up to the Bulls Head Public House in Lititz, Pa., for Session Beer Day yesterday. They did a total session beer tap takeover: all 16 taps, including the two beer engines, were pouring beers at 4.5% and under. Beautiful thing, and only TWO of them were "session IPA." I tore into them, and here are some impressions. Loch Ness Scotch Ale (tagged as "Malty Brown") -- Might have been my favorite of the day; on cask. "Malty brown" indeed; good body, chocolatey sweet malt, not a bit of cloying stickiness, great beer. If there hadn't been all the choice, I'd have happily drunk this all afternoon. Neshaminy Creek Croydon Cream Ale -- Clean, lightly sweet, a bit of breadiness, and fresh as a daisy. Nice pint. Stiegl Radler Grapefruit -- My guilty pleasure. "Like a beery Squirt," as one person put it, and it captures the best of both. The grapefruit is just tart enough, the beer's there without being gak weak. Totally enjoyable. St. Boniface Bulls Head Bitter -- From a local brewer (Ephrata) specifically for the Bulls Head; nicely done, drinking easy, great light balance of malt and hops. Exceptional. Weyerbacher Tarte Nouveau -- Light, tart, refreshing, just enough going on. Well-done sour session. Oxbow Space Cowboy -- Session-strength biere de garde, which I've learned recently is not so odd after all; BdG was often relatively light. This one's good from nose -- spicy, malty -- to tail -- clean bitter finish. Nicely done indeed. Ballast Point Mango Even Keel Session IPA -- I always have high hopes on mango beers -- love mango! -- always disappointed. This smelled perfumey with mango, almost too much, and then the beer just slapped me with stupid bitter in the mouth, totally out of frame for its weight, and the mango tasted way off. Not good at all, I left over half of it on the bar. Harviestoun Old Manor -- Also cask, and delicious. Brit malt -- chewy, tasty, dry, biscuity -- and earthy hop, and light carbonation so you can actually taste it all. Delicious pint. Want to go to Ireland with me this Fall? Here's an advanced notice: it looks like I'm going to be the Whiskey Guide on an Irish Whiskey tour, in Ireland, this fall, the week of October 28-November 6. I'll be along to answer all your whiskey questions, to set you in the proper context, to walk with you to the pubs, to keep the whiskey people on the straight and narrow, and to help you make great decisions in the whiskey shops. It's going to be a great time! No price yet, but the tentative numbers I've heard sound reasonable. More details when I have them, but set the dates aside now! I just found out that country music icon Merle Haggard died. I still intend to continue with my backed-up Irish whiskey reviews, because hell, they're whiskey, after all; they even spell it right (though Merle was a Dickel fan, and they don't). But I am going to listen to some Merle, including his classic Okie from Muskogee. "They still wave Old Glory down at the courthouse, and white lightnin's still the biggest thrill of all." I'm not going to reach for Merle references in these reviews, but I'll be damned if I ignore one that's looking me right in the eye. This is poitín, Ireland's fabled "mountain dew," the white lightning of the Auld Sod. (See what I had to say about it in the sidebar at the bottom of the page here.) Mad March Hare got off to a rough start, being set for production at the Rathmooney distillery in Dublin; when that collapsed, they found digs in western Cork, an all-malt, pot stilled spirit, according to founder John Ralph. And that's about all I can tell you about it...for sure. Except how it tastes. Well, it smells like it just came off the worm. Fruity and a bit feinty, grain, fat, and wet copper on the nose. A rare visual note: it rolls slowly in the glass, like chilled vodka. Ominous. Poitín, of course, has a reputation as a wicked strong and weird liquor, but this is at 80 proof only. Time to put that aside and taste it. It is thicker and a bit oily on the tongue, with a grainy sweetness. Not that hot, and there's an appealing mineral touch, almost like graphite from pencil leads. The sweetness is a bit much, but it's not gross. I'd want to mix this, probably with a bit of tea or light fruit juice, like apple. For all the Mad March Hare look, this is fairly tame, especially at 80 proof. Through a bus window; sorry. Spiced fruit and malt in the nose, with some heat and bright bark/pine hints. Quite nice on the tongue, and not clearly identifiable as one or the other...maybe Cooley, but I thought that was cut off by Beam Suntory. Okay, so it's a relatively dry and warm single malt, intensely focused in a tight spot of malt, like a Munich helles, not really wandering into the fruitiness thing. There's a fast flash of heat, then that unrelenting dry, almost dusty malt. I'm liking that; it's not a whiskey that lets you relax, more like a sergeant of a whiskey. Come on, lad, there's drink to be had here, pay attention! None of this sweet fruit languor for us, hey? 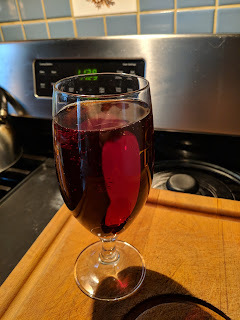 The finish is firm, without being overly oaky, but there's a touch of sweet alcohol in the middle that's not quite as happy-making as the rest of this, though it passes quickly. It's a different chapter in the Irish whiskey book, for sure, and that's a plus. Now THIS little beauty is something I picked up last month in Dublin at the Celtic Whiskey Shop. I'd had it two days before at the Dingle Whiskey Bar in Dublin, and really wanted more of this. I'm glad I swallowed my usual reluctance to lay out long green on a bottle (90 Euro), because it's real good, and...it's gone. I got bottle 910 of 1000. It was blended and bottled by the folks at Teeling Whiskey Co. from casks selected by W. Aherne (owner of the Palace Bar) and Palace bar patrons. That's pretty cool. Now, when you have a whiskey in a bar, with new friends and old, and the craic is great, and the hour is late...well, you have to wonder the next day just how good the whiskey really was. So I was a bit nervous the first time I opened it up. Sigh...no worries. Doughy sweet malt, orange marmalade, and light baking spices, well-balanced and oh so pleasant. On the tongue, this blows away all the sophistry about "what is Irish whiskey?" Anyone familiar with whiskeys and whiskies would pick this out as Irish right away. The fresh and lively malt so high in the mouth and nose, the happy fruitiness of it, and the light hand of the oak, all come together and make merry, warming and yet cooling at the same time. Whiskey is a mystery. Whoosh, that's good stuff. I am going to draw up just short of that "Stellar" rating, though, if only because it's just a bit on the simple side. I want more depth, and a bit more rounded in the middle, where it gets a little hot. But that's very much on the high side of Good! Well, Merle, you went out on your birthday. Kind of the way to do it. Hope I hear a lot of you this coming week. You didn't live forever, but you had your share. Cheers, fella. It's Beer Friday #9, and beer is a famous aid to love (ill-considered and otherwise), and it's Date Night in the Bryson home, so...what else could we play but this classic? It's also the last Beer Friday before Session Beer Day, April 7, so today I'm doing all session beers, as defined on the Session Beer Project page: tasty, multi-pint drinkable, and 4.5% ABV or less. Pretty easy, these days. 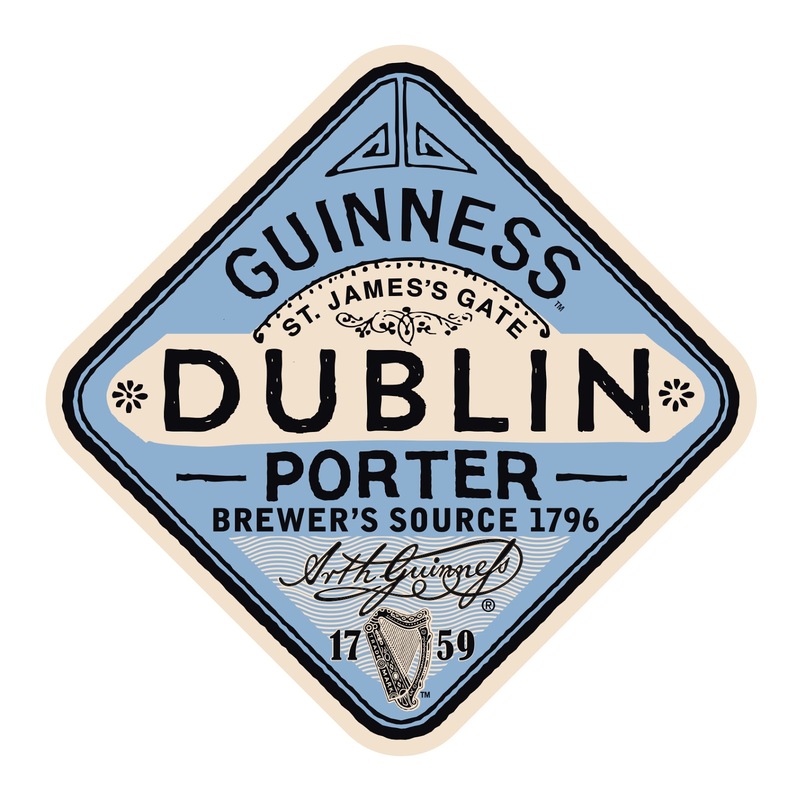 I've had this beer three times now: last July at Davy Byrne's in Dublin, last month at...Davy Byrne's in Dublin (lucky, what can I say? ), and now today. The other two were draft; this is not significantly different, which is great. One thing that won't happen today is that little frisson of sheer terror I felt when I thought the manager pulled out a pistol in the back of the place while having a sharp discussion with a waiter; turned out to be a heat gun that he was using to touch up the weatherstripping. It was a moment, though, I'll tell ya. 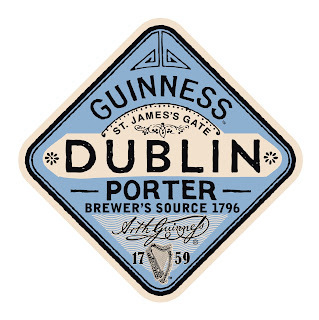 I'll tell ya this, too: if you're looking for "robust" porter, or "imperial" porter, or "Baltic" porter...this ain't it. This is a quaffer, and it has a very light body, a light roasted grain quality, a light chocolate note, and a hint of hop bitterness at the close. That said...if I had another, I'd drink it, like I did at Davy Byrne's. I've heard people slag this beer for being too thin; during last year's "heat wave" in Dublin (got up to almost 80°!! ), it was beautifully quenching. Just what it's for. Still, I have to admit, if there were a good mild on, or Deuchar's, I'd probably be one-and-done on this one. I'll be honest: "session IPA" has become increasingly problematic for me. It's come to symbolize the depressingly low amount of true variety in American brewing, and the reductio ad amaritudinem of the beer-drinking niche masses. "All Must Become IPA" seems to be the challenge phrase of brewers ("Unless It Is Sour" being the in-group response). 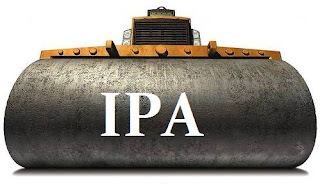 And since brewers started making "session IPA", the whining resistance to lower ABV beers has diminished significantly. As I remarked years ago about pilsners; as long as they have their hop-soaked sucktoy, they're fine. Still, it's all session today, and what's in the fridge is what's in the fridge, so session IPA it is. 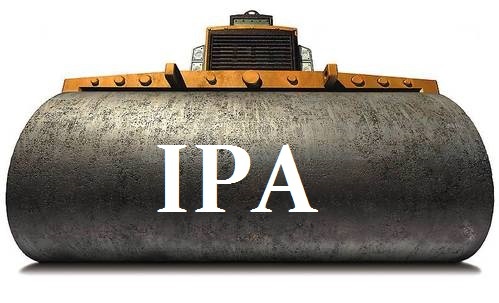 Magic Hat's had a weird history with IPA for me. There was Blind Faith, which was good, and then not so good, and then good again. There was HiPA, which I loved, till it disappeared, and now it seems to be back again. There's the grapefruit-infused Electric Peel, which despite a growing suspicion of the whole fruited IPA movement on my part, I kinda like. And now there's this. Let's see. Not screaming hops on the nose, more like a malt-balanced lager with a little bit of lemony citrus in there. Oof. More disappointing on the tongue: this is simply bitter, without much flavor of hop to it at all. I'm trying hard to find redeeming character here, and oddly enough, it's in the malt. There's a half-decent base beer under there, but the overhopping — cack-handed overhopping — is killing it. I'm afraid we have our first Crap beer. Magic Hat can do better, and I hope they kill this, or pull it in for a quick retooling. I can't recall the last time I had a genuine Belgian Kriek, and that's a damned shame. I got this sample from Lanny Hoff at Artisanal Imports; Lanny's carried great beers for almost as far back as I can recall, so expectations are high. Fruited Flanders sour, 4.5%: perfect for fighting the Session IPA Blues. Let's go! Beautiful ruby beer with just-barely-pink foam: happy stuff. Tart cherry nose, with an additional acidic edge to it that's clearing my sinuses. Yeah, that's what I'm talking about. Roundly balanced, a beer that clocks in on your tongue with BEER over here and CHERRY over there and SOUR over there and JUICY over there, all hanging off opposite sides on the edge of the spinning top that is this beer on my tongue. One small complaint: about halfway through the bottle, it's getting a bit sticky in the back of my throat. I try a big swallow, and that's gone, but a small complaint. It's not killer. It's not crazy, or over the top, or wicked sour, or any of that. And sometimes I WANT that; sometimes I want to get puckered and almost scared, sometimes I want to get hopsmacked right in the chops. But when I want to have a beer that lets me breathe, just enjoy life? I want a beer like this, a beer that knows what it's doing, does it well, and really delivers. Nicely done. Thank you, Belgium. 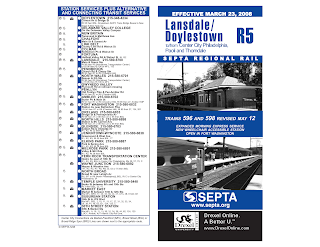 Named for the old designation of the SEPTA Landale/Doylestown line, R5 has been out and a bout for a bit, and I grab one when I can. Tonight I took a bit of a longer linger with it, and here's what I found. It's a quick entry; I did say, it's Date Night! Very nice lager, good mouthfeel for a session beer (which so few have), and no off-flavors. Disappearing quickly, too. Not overly hopped. Good quaff. Tasting Whiskey dinner at the Bulls Head, April 10! We'll have more than two whiskeys, trust me. Finally got the menu for my whiskey dinner at the General Sutter in Lititz, Penn. next Sunday, April 10 (that's Sunday a week, as we say in Pennsylvania Dutch country up there, now). The details are below: I'll add that I'll have copies of Tasting Whiskey you can get signed, that these are some excellent whiskeys, especially...actually, especially ALL of them. That's a top-notch selection, and one you will NOT see at just any dinner. Paul and I picked some real beauties for this dinner, and I'll tell you all about them. 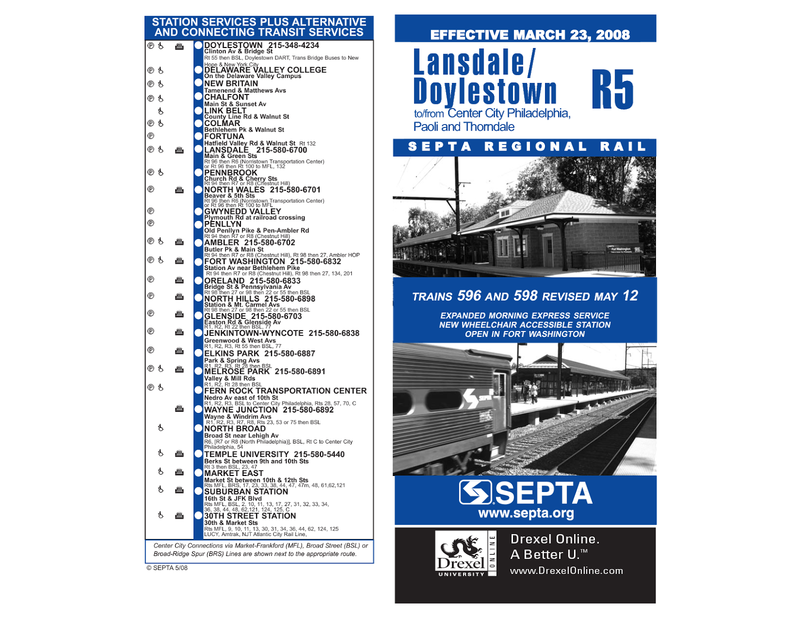 This dinner is definitely worth the trip from Philly, the Main Line, Harrisburg, Lebanon, York, or Reading; I guarantee. Just be careful about getting home! Join us for a Whiskey Dinner with Lew Bryson, the former managing editor of Whiskey Advocate and author of Tasting Whiskey. The event will feature the following "All American Whiskeys"
To make reservations, please contact us at 717-626-2115. New Brewery Tour in Montgomery County April 9! Some good friends of mine are raising funds to bring a music camp to poor kids in Guatemala, using a very clever technique: beer. Here's the story -- THREE brand new breweries, transportation, raffles, music, fun stuff -- and HERE is the link to get your tickets. If I weren't judging a homebrew competition that day, I'd be on the bus (and I may drop by Stickman for a couple beers after things wrap up). Do this, for the fun, for the mission! JOIN US ON THE CRAFT BEER BUS! Visit Stickman Brews, Stable 12 Brewing Company, and Tuned Up Brewing Company with us. Tickets are $50 with $10 going to Music in Motion to help fund our mission trip to Guatemala. Read below for more details! Have you been wanting to try the three amazing new breweries in Royersford, Spring City and Phoenixville, but just haven't had the time? Well, mark your calendar for April 9th, because you'll get the chance to visit all three in one great afternoon. The tour begins (pick up location) at the new Stickman Brews brewery in Royersford then heads to Stable 12 Brewing Company in Phoenixville. Our last brewery is the newest of them all, Tuned Up Brewing Company in Spring City. 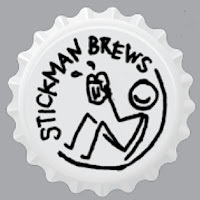 We will then head back to Stickman Brews for more fun, food and beer! This is the first tour of these new local breweries and you do not want to miss it. Each brewery has a unique way of creating beer so this local tour is a must for the true beer geek in your life! Each brewery is donating a portion of their sales back to the MIM mission while we're there, so let's fill the bus!! At each stop you'll have the opportunity to try various styles of beer from three different types of breweries, learn more about craft beer and Music in Motion, buy some food and a beer (or two, or three - that's why there's a bus! ), and take chances on raffles and other fun prizes. We'll have a 50/50 raffle going on all day! Rumor has it, there will be A LOT of singing on the bus, too. :) If you have a guitar, bring it along! Help us raise money for a mission trip to Guatemala in August, to support a music-centric "band camp" for children. Need I say more? Don't worry, I will. Music. Kids. Need. I had good intentions ("paving the road to hell," as I like to say) of doing Irish whiskey reviews on the run-up to St. Patrick's Day, but as I've said several times, my health had other ideas. One of the worst colds I can remember laid me and my sniffer low for almost five weeks, and I'm still not completely recovered. But I'm well enough to review whiskeys, so I'm going to go ahead and do the Irish I had lined up, because they tell me that Irish whiskey isn't just about March 17th anymore. This week it's two from Ciaran Mulgrew's new "The Quiet Man" line, blended and bottled in Derry, Northern Ireland. I talked to him back in January about his whiskeys, which are named for his father, John Mulgrew, who was a "quiet man" behind the bar he tended for 50 years: heard your stories, but kept them to himself. 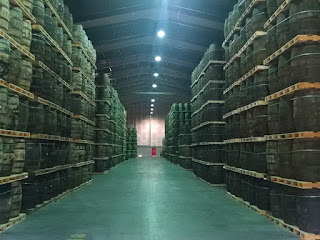 Ciaran's a bit of a quiet man himself when it comes to revealing the source of his whiskeys; Bushmills, given the location of his operation and the 8 year old single malt bottling? 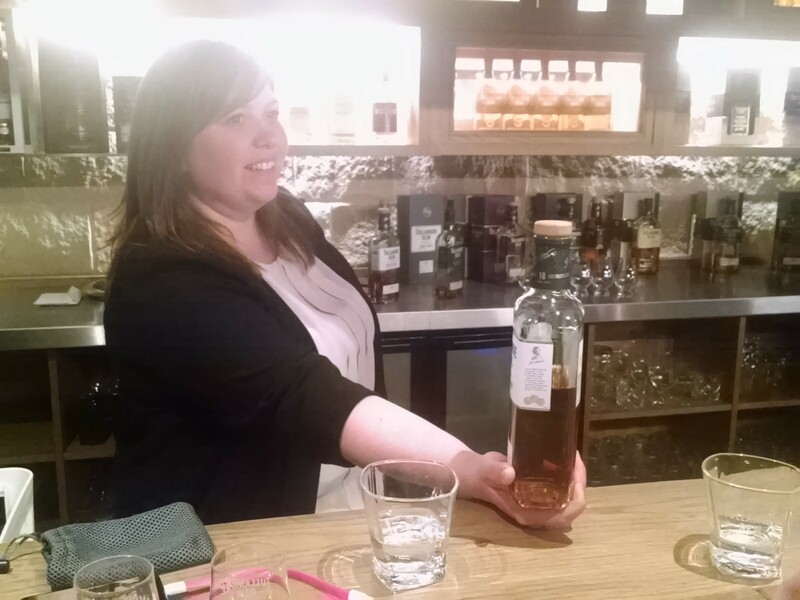 Cooley, where they've also done single malt? Neither are selling a lot of whiskey to bottlers. Nothing is confirmed or denied. I asked Mulgrew what set his whiskeys apart from the growing flood of new entries to the category. "The Quiet Man is matured in first fill bourbon barrels," he said, "which have had bourbon in them but never any other whiskey. Most Irish whiskey and Scotch is matured in bourbon barrels, but the barrels may have had whiskey filled into them four or five times. This reduces the impact of the wood upon the spirit. In addition, the traditional blended variety has a high malt percentage, making it more premium and giving it a smoother finish." Mulgrew's not a pro; or rather, he wasn't before he released the whiskey last year. "It has been a long time coming, but this is my first entry into the whiskey market." 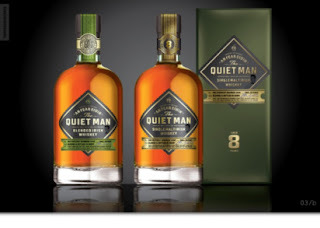 The Quiet Man is being distributed in the U.S. by Luxco, who should be able to supply fresh bourbon barrels. Luxco is supporting the brand with tastings both on and off-premise; keep an eye out for them. Quick grainy smell as I open and pour. Sweet grain in the glass, along with penny candies, cornmeal, and orange marshmallow. Quite sweet on the tongue, very Irish in character. Light, friendly, no overt oakiness. Sweet but not cloying, with some light golden raisin fruitiness. Pleasant and approachable; maybe a bit too sweet from the bourbon barrels, without corresponding depth, but a good whiskey for introductions and carefree drinking. The question would be whether to have this, at a common price of about $35 a bottle, or Jameson/Tullamore/Bushmills/Paddy/Powers at anywhere from $7 to $15 less. This seems a bit pricey. Hoping for a bit more here. The blend, while not labeled for age, is thought to be about 4 years old. Expecting a bit more structure from an 8 year old single malt. Yup, more oak in the nose; nougat, sandalwood. A lot more oak on the tongue, more of the sandalwood, a nice warm cereal character, as well as a pleasantly oily texture. This has a lot more going on, not simply sweet and fun. If I didn't have more tasting to do today, I'd pour another full measure and just enjoy this one. Coming up next: Egan's whiskey and poitin.